An elegant and distinctive luxury 320 sqm villa with pool in a fenced 6,500 sqm private plot, with breathtaking panoramic views, located right in the middle of the island of Crete. An elegant and distinctive luxury 320sqm villa, with a breathtaking and panoramic view of the Cretan Sea, a Mediterranean style garden and spacious private swimming pool, in a fenced 6.500 sqm inclinated landpiece. 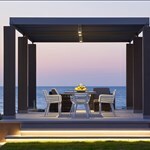 For those who want to experience the discreet luxury and privacy, the island of Crete has the optimum solution, in the form of Aspalathos Villa to redefine the limits of hospitality. The Aspalathos Villa is located in the Lygaria - Agia Pelagia area, in the middle of the northern coast of the island Crete, just a few kilometers from Heraklion and its International Airport. The magnificent sandy bays of "Lygaria" and "Madé" are a stones throw from Aspalathos while the cosmopolitan Agia Pelagia will spoil you by choice of dining and night outs. The property can accommodate up to 11 Guests in its 5 spacious and tastefully decorated bedrooms. The villa features one bedroom with dome style roof (known as “Santorini style”), with a super – king size bed, spacious wardrobes, bedside tables and a luxury ensuite bathroom with bathtub. The room has access to a private very spacious terrace with breathtaking panoramic sea and mountain views. The second bedroom features a king size bed, bedside tables, wardrobe and dressing mirrored table. It also has access to a terrace with spectacular mountain views, overlooking the garden and sea. The third bedroom has two single beds with bedside tables, wardrobe and dressing mirrored table. It also features an ensuite bathroom with a shower cabin and luxury marble and mosaic surfaces. This bedroom has a balcony with amazing sea view. The guest room of the villa features a romantic four-poster king size bed, a single bed and bedside tables. The guest room also has a private bathroom with shower. All rooms are air conditioned, with free wi-fi, high-quality mattresses and high quality bed linen. All bathrooms include natural cosmetics, hairdryer and shaver outlet and other facilities. The kitchen is fully equipped with every utensil that you might need during your stay and branded electrical appliances. The dining and living room area is very spacious and light full with magnificent views. The exterior of villa Aspalathos consists of terraces and balconies with stunning views. Comfortable sofas will host the endless moments of relaxation with beautiful sunsets on the background. Villa Aspalathos is flawless and although many people might argue that perfection is unreachable; this majestic property is very close to it. A perfect balance between architecture, aesthetics and the unique location. The Aspalathos Villa is located in Lygaria - Agia Pelagia area, in the middle of the northern coast of the island Crete, just a few kilometers from Heraklion and its International Airport. The magnificent sandy bays of "Lygaria" and "Madé" are a stones throw from Aspalathos while the cosmopolitan Agia Pelagia will spoil you by choice of dining and night outs. 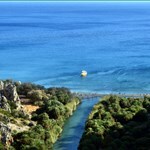 The picturesque village of Agia Pelagia is built around an old traditional fishing village on a sandy bay, about 3.5 miles West of the "Aspalathos Villa". The nightlife is not so "strong" here, but there is a great variety of traditional and international restaurants, taverns, cafes and bars, all with wonderful views of the Aghia Pelagia bay. In the center of the village, you can find everything you might need for your holiday, such as super market, pharmacy, doctors, vehicle rentals, tourist office, souvenir shops, boutiques, internet cafe and ATM. The "Aspalathos Villa" is close to the highway and is almost in the center of Crete, which gives you the opportunity to explore by car, across the island, by arranging daily excursions. Taverns/Entertainment: 100 meters from "Aspalathos Villa" there is the “Spyros-Soula” family restaurant, offering traditional Cretan dishes that can be also delivered to home. Even many dining (Traditional Greek and international cuisine) places in Lygaria and Agia Pelagia Shops, Cafes, Bars & Beach Clubs, 10 minutes by car in Agia Pelagia and Lygaria. 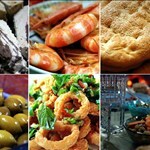 Shopping/Supermarkets/Beverages: Mini market at 100 meters, also in Lygaria and Agia Pelagia.